Microsoft publicly released the “final” version of Internet Explorer 8, today. Hopefully this will help decrease the amount of users still plodding along with IE6 and convince them to upgrade to either IE7 or IE8. One the main Web site for which I am responsible, IE6 users still make up nearly 25% of our visitors. 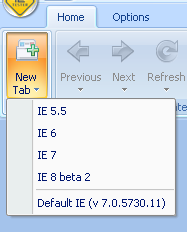 If you haven’t already, head on over to Microsoft’s Web site and download IE8. Hopefully IETester will be updated with the final version, soon.